There are some new items today for your enjoyment: escarole, shallots, and Misato Rose radishes (the big ones that look like turnips), and mustard greens. The escarole is a chicory which you can read about in Monday’s post – basically a salad green. The shallots you can use like onions – their flavor is a bit milder. They are nice as an addition to a vinaigrette dressing. The radishes are a winter variety, similar to “Watermelon radish” because of their red/pink/white interior. The flavor of the interior is fairly mild for a radish, and the color would look nice on a salad, sliced into thin rounds. It also could be roasted with other root vegetables or pickled. Also, the radish greens are edible (similar to turnip greens), and I would add them to whatever I’m doing with the mustard greens. The mustard greens are a bit slug-bitten, but hopefully taste good! They are a braising/sautee’ing green with a unique flavor and are delicious with dal, or any other dish which calls for a cooking green. Also in your share: garlic, acorn winter squash, and fingerling potatoes. The fall fieldwork is getting checked off the list, bit by bit. Most areas of the farm have little fingers of rye cover crop poking up now. I have more indoor work to do, like shelling the dry fava beans for next year’s planting and cleaning the rest of the garlic. Then of course I need to enter the harvest records into the computer and start figuring out next year’s crop plan. I’m actually excited for the computer work, which may say something about how much time I’ve spent outdoors this season, or maybe that I’m crazy, I’m not sure. 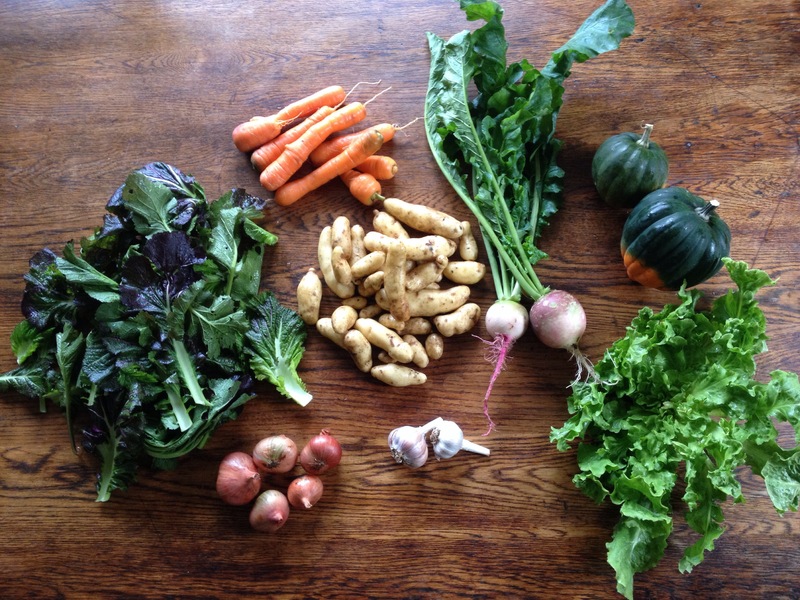 The last two CSA pickups are next week, and then the first week of December. The week of Thanksgiving there are no pickups.